Officer Erica Donovan is an exemplary member of the Metrobay Police Department and a hardworking civil servant. Despite her relative youth and inexperience, she’s proven her mettle in countless busts and police stings throughout her short career, her firm and yielding dedication and expert skills and calm under fire catapulting her through the ranks of the force. Personally mentored by Police Chief Coleman, Erica’s reputation spread and she holds the respect of many other officers, both junior and senior to herself. After several intense police operations, she received a personal request from Warden Smith to transfer her to the Metrobay Prison for the Criminally Insane, aka The Funhouse, a place notorious for its many supervillain inmates and rigid staff qualifications. 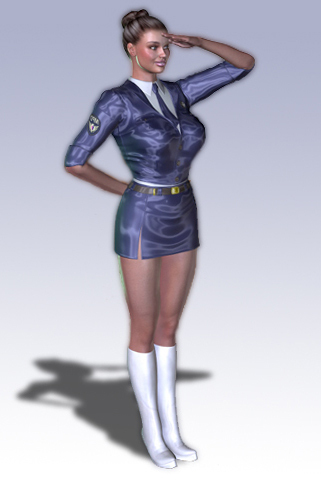 Erica eagerly accepted the position and a promotion to sergeant and left to join the Warden looking after the worst of the worst that Metrobay had to offer. Erica now currently serves Warden Smith and Belinda as an obedient slave, eagerly carrying out their orders, the first of which involved the capture and imprisonment of heroines Bluebird and Swallow, a task she carried out with emotionless efficiency. Erica is a recent graduate from Metrobay University and, despite her clean and responsible law enforcement career, has a reputation amongst the frat boys there as quite the party girl. There are hints she might have a few other embarrassing skeletons in her closet as well, but if so, she’s not talking.